Georgia has a solid claim to be the birthplace of wine, a birthright dating back at least 8,000 years. Chkhaveri is one of those Georgian grapes that is described as ancient and indigenous, among other quite positive descriptions. It also makes wine in the white, red and rose varieties, depending on the producer and the region. 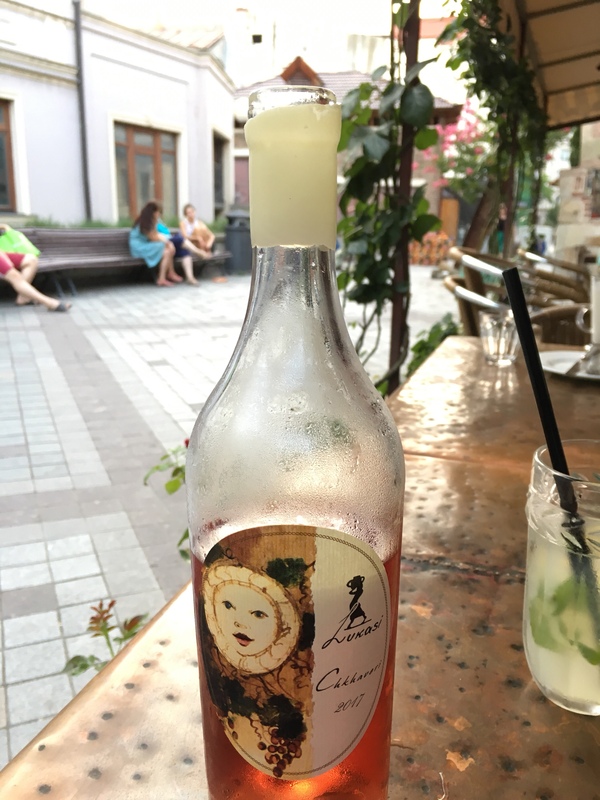 The grape tends to fall flat when faced with fungal diseases and phylloxera so it was quite at risk until recent decades when it now appears to be making something of a comeback even if true Georgian wine converts still have a hard time finding it regularly in the Tbilisi supermarkets. Watercolor wine in a style resminiscent of the Monet, Cezanne era. Hard to pin down exact color (is it light red, light orange, aperol? ), hard to pin down the exact taste (is that light strawberry, rose on the lips, maybe a smell of a raspberry?) but the lightness and length of the wine shimmer on for a long time and the combination is lovely for a hot afternoon heading into evening. Ripe for sunsets in hot climes. * Chkhaveri is the English writing of the Georgian grape – ჩხავერი – which gives a sense of how different the languages and scripts are from each other. * Georgian script (all 3 of them to be specific) is one of the three UNESCO Intangible Cultural Heritages. The other two are wine (from the clay amphora known as qvevri) and polyphonic Georgian singing. All 3 well deserved.